Cold Spring Harbor, NY — Cold Spring Harbor Laboratory (CSHL) Professor Adrian Krainer today received the 2019 Breakthrough Prize in Life Sciences. Collaborators Krainer and C. Frank Bennett from Ionis Pharmaceuticals won for the development of the first effective therapy for the neurodegenerative disease spinal muscular atrophy (SMA), an illness that has been the leading genetic cause of infant death. "Congratulations to Adrian Krainer, who has demonstrated the power of basic research to change people's lives," said CSHL President and CEO Bruce Stillman. 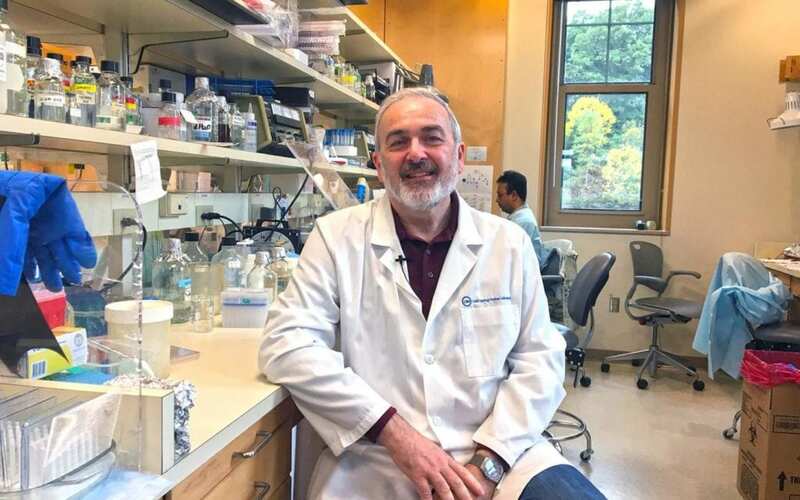 "For more than half a century researchers at CSHL, including Dr. Krainer, have worked to understand fundamental biological processes, like RNA splicing, and these efforts have now led to the development of a life-saving drug." The Breakthrough Prize in Life Sciences honors transformative advances toward understanding living systems and extending human life. Krainer's work did just that when he developed a new therapy for SMA based on a biological process called RNA splicing. SMA is caused by a faulty Survival of Motor Neuron (SMN1) gene, which produces a protein that is crucial for motor neurons, the nerve cells that control muscles. Using their knowledge of RNA splicing, Krainer and his CSHL colleagues, in collaboration with Bennett's team at Ionis, developed a way to activate a less powerful but similar gene called SMN2, so that it makes more of this crucial protein. The resulting drug, nusinersen (Spinraza®), was successfully tested in clinical trials, sponsored by Ionis and Biogen, resulting in FDA approval in 2016. Nusinersen is the first FDA-approved treatment for SMA, and is the first of a promising new breed of antisense therapies now in development for various neurological disorders, cancer, and other diseases. "I strongly believe in the importance of collaboration between academic research and industry," Krainer said. "Frank and I, and our respective teams, have different areas of expertise–on RNA splicing and antisense pharmacology. It was by combining our unique strengths that we managed to accomplish something so important, from which thousands of SMA patients are now benefitting." "Working with Adrian has been one of my most enjoyable collaborations," said Bennett, "It was like two streams of basic research coming together. It was almost magic–the way things ended up working." The Breakthrough Prize award ceremony will take place on November 4th at the NASA Ames Research Center in Palo Alto, California. Founded in 1890, Cold Spring Harbor Laboratory has shaped contemporary biomedical research and education with programs in cancer, neuroscience, plant biology and quantitative biology. Home to eight Nobel Prize winners, the private, not-for-profit Laboratory employs 1,100 people including 600 scientists, students and technicians. The Meetings & Courses Program annually hosts more than 12,000 scientists. The Laboratory's education arm also includes an academic publishing house, a graduate school and the DNA Learning Center with programs for middle and high school students and teachers. For more information, visit http://www.cshl.edu.